What did the Romans wear? The Romans mainly wore clothes made of wool (and linen was also imported from across the Roman Empire). The style of clothing was influenced by the clothing worn by the Ancient Greeks, but it also evolved over time, incorporating fashions from all over the Empire. Roman men usually wore a chilton (a type of tunic which came down to the knees). This could be sleeveless or have short-sleeves. A cloak was often worn over the chilton. When the weather was cold, Roman men often wore more than one tunic. Only free Roman citizens were allowed to wear a toga. Originally, togas were worn without tunics underneath, but it soon became normal to wear a toga over the top of a simple tunic. The toga was a large (sometimes 3.5 metres wide) semi-circular piece of woolen material designed to be draped over one shoulder and then folded to fit the body. Sometimes lead weights were sewn into the hem of the toga to help it to hang properly. By law, standard togas had to be white. The stola was a long tunic. It commonly reached to the ground and could be sleeveless, have short-sleeves or long-sleeves. It was usually worn over another long tunic. A palla (a smaller and simpler version of the toga) was often worn over the stola. Women’s clothing could be quite colourful. The most sought after colour was Tyrian purple, created from a dye extracted from the glands of murex sea snails. Most Roman children wore a simple tunic, belted at the waist. Children would wear a bulla (a type of amulet or charm) which was given to them when they were very small. Boys would wear it until they reached the age of sixteen and girls would keep it on until they were married. Rich boys wore a toga with a purple edging. Romans wore a simple loin cloth, kept in place by knots at either side of the body. Instead of bras, women wore a band of material tightly tied across the body. Undergarments were usually made of linen, but women also used silk when if they could afford it. There were several different types of cloaks, and the styles changed over the history of the Roman Empire. Cloaks were basically the jackets and winter coats of the Romans. 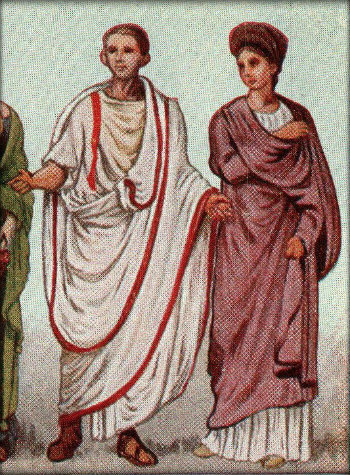 They were worn over tunics and togas (although they sometimes replaced the toga) and they often had a hood sewn into them. Cloaks could be brightly coloured and sometimes made of leather or felt. Roman men and women often wore the same types of shoes. There were lots of different options available to the Romans and the style they went for would have been affected by the weather and whether or not they were inside or outside. The calcei was an outdoor shoe made from soft leather. It was worn by most Romans. Sandals were thought of as indoor shoes. Rich Romans would employ a slave to carry his sandals for him so that he could change into them when he stepped inside a building. The Romans also wore a type of slippers when they were indoors. 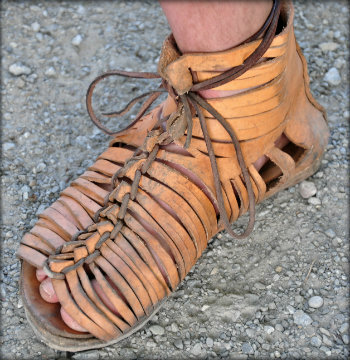 Roman soldiers wore the caliga – a type of military boot / sandal. It had hobnails and was very hard-wearing. Find out more facts and information about the Romans by visiting our Romans resources page. Glad we were able to help you out, Kam. Thanks for using Primary Facts. Thanks for posting this, it helped me out a lot with my homework! Awesome site! Helped me get through a 90 pt social studies project! This is really helping me on my Roman project.